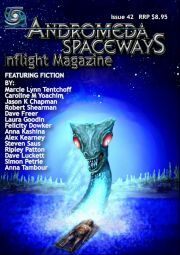 You are currently browsing the tag archive for the ‘Andromeda Spaceways Inflight Magazine’ tag. It has been nine years since ASIM blasted off, helmed by a co-op of editors drawing on a pool of readers filtering the anonymous slush, and this issue – the 50th – marks considerable achievement both in terms of longevity and recognition. The milestone also coincides with a change in the print cycle, with future issues to come out quarterly rather than bimonthly and increase from 100 pages to 160, with a resulting rise in cover price. So how has the big five-oh been marked within the magazine? 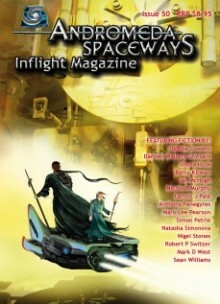 Firstly, the cover art harks back to that of the first issue by Les Petersen, rather than highlighting a story as is usual, and some of the co-op’s editorial board have each selected a story for inclusion, with a note detailing the reason why, rather than the regular procedure of having one editor responsible for each issue. The issue is also a precursor to the new direction, boasting 164 pages, containing 13 short stories, two poems and assorted features including a retrospective of previous co-op members: a lot of talent has passed through the doors. “Thief of Tears”by Jason Crowe – When a woman wants to exact revenge on a cheating lover, or simply give him a timely reminder, someone needs to collect the essential ingredients for the appropriate spell. Not a nice job, but it has to be done – and it isn’t always tears that are required. An old story of how far we can fall from an innocuous beginning, but given a twist of fantasy. I often find stories that appear in Andromeda Spaceways Inflight Magazine (ASIM) a little disappointing; they so often seem to stop just short of their full potential. Either they are quite a lot of words leading up to what often seems to me to be a slight punchline; or they seem to be just a draft or two short of turning a really good idea into a really brilliant story. In the case of the first problem, that may just mean I don’t really have the right sense of humor for ASIM. In the case of the second, well, it’s a matter of opinion. ASIM certainly consistently attracts and publishes some very good writers with very good ideas. Those familiar with ASIM will know that the editorship of each issue rotates; Edwina Harvey helmed Issue 42. Although I had my usual reservations about some of the stories that appear here, the issue is on the whole one of the better ones I’ve read. The magazine is also becoming more readable; behind the scenes areas such as layout and proofreading seem to have improved so that you’re less distracted by small hiccups. It overall seems slightly higher quality than some of the early issues.